Premier Kathleen Wynne is defending the Liberal government’s decision to introduce a cap-and-trade program next year to combat climate change, calling Ontarians “very bad actors” when it comes to creating greenhouse gases. Well, if that's true, perhaps we should go conquer lands with more moderate climates. The latest reporting on emissions for Ontario shows 170,000 kt CO2 eq. in 2014 - exactly 170, 000 kilotonnes of CO2 equivalent emissions. Statistics Canada shows the population for 2014 as 13,685,171. 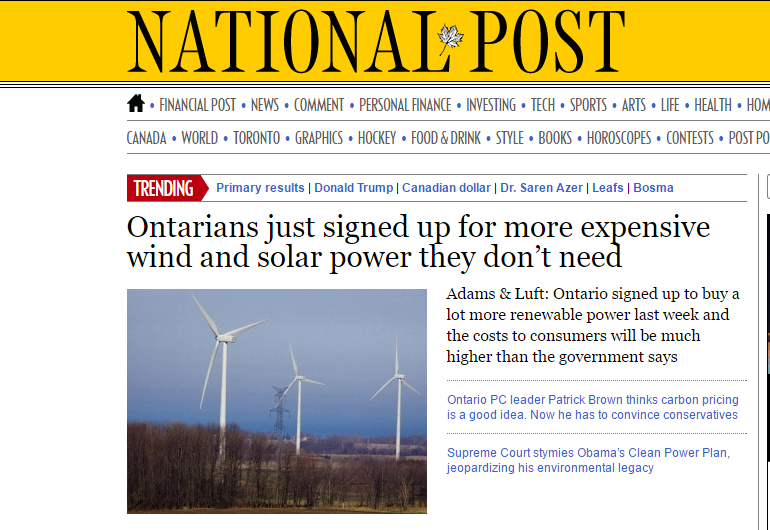 Therefore, the per capita emissions were about 12.4 tonnes (thousand kilgrams) per Ontarian. That's not particularly high for a northern climate, and it's about the OECD average, according to the OECD. Perhaps if the Premier didn't measure Ontario against 1990, ignoring the province's 32% population growth (1990-2014), and listen to comparisons - in absolute reductions - to stagnant population countries such as Germany, she'd be a little more up on per capita emission trends. Meanwhile, at the often excellent Energy at Haas blog, Meredith Fowlie asks Is Cap and Trade Failing Low Income and Minority Communities? The Advanced Fuel CANDU reactor (AFCR™) is a 700MW Class Generation III reactor based on the highly successful CANDU 6® and Enhanced CANDU 6® (EC6®) reactors with a number of adaptations to meet the latest Canadian and international standards. Its fuel flexibility allows it to use recycled uranium or thorium as fuel. It has a heavy-water moderator and heavy-water coolant in a pressure tube design. CANDU reactors can be refuelled on power and have one of the highest lifetime capacity factors among the world’s reactors. MONTREAL, Sept. 22, 2016 /CNW Telbec/ - SNC-Lavalin (TSX: SNC) is pleased to announce it signed an agreement in principle for a new Joint Venture with China National Nuclear Corporation (CNNC) and Shanghai Electric Group Company Ltd. The new company would develop, market and build the Advanced Fuel CANDU Reactor (AFCR™). The creation of the joint venture in principle follows the signing of a framework agreement in 2014, and is subject to all government and regulatory approvals. The new company is expected to be registered in mid-2017, and would be followed by the formation of two design centres - one in Canada and another in China - to complete the AFCR™ technology. This could lead to construction of the world's first two AFCR™ in China, and possibly subsequent builds in China and around the world. "This is a game changer in the nuclear industry, and a great endorsement of our expertise and CANDU nuclear technology from the largest nuclear market in the world," said Sandy Taylor, President, Power, SNC-Lavalin. "Each new build in China, and anywhere in the world, will benefit Canada in terms of job creation, innovation and nuclear research & development, environmental stewardship, and will contribute to reduce global carbon emissions." Canada's nuclear sector directly contributes to over $6 billion to the economy annually, employs more than 30,000 highly trained and specialized people, and creates an additional 30,000 jobs indirectly through contracting. "There were wind shortfalls in all but one of the 28 High HOEPs during the Current Reporting Period"
Industrial wind turbines are driving extreme prices in the Ontario market according to the latest report from The Ontario Energy Board (OEB) Market Surveillance Panel (MSP). And the past week's market performance. Both spikes appeared to be due to renewable and demand forecasts being poor predictors of actual market conditions. The OEB's new report is therefore very relevant today, despite being for the period from November 1, 2014 to April 30, 2015. In the Current Reporting Period there were 28 hours in which the HOEP exceeded $200/MWh (High HOEPs). This Period also had the highest HOEP since market opening, reaching $1402/MWh in hour ending 8 on February 20, 2015. The High HOEPs were primarily caused by under-forecasts of demand and short-notice losses of supply (curtailing of imports and under-generation of wind facilities relative to their forecast production). Identifying the factors that lead to deviations between the PD-1 MCP and the HOEP provides insight into the root causes of price risks that participants, particularly importers and exporters, face as they enter offers and bids into the market. This is the complicated data explanation of the simple mechanism through which forecasts can cause price spikes (for the reported period almost the exclusive cause of high priced hours). "Demand" to the MSP is demand from IESO grid-connected generators. If the forecast for wind, and solar, is light the demand for grid-connected supply would be greater as embedded wind, and/or solar, would be less productive than expected too. A ‘wind shortfall’ occurs when real-time wind output is less than the hour-ahead (PD-1) forecast. Conversely, under-forecasting of demand occurs when real-time demand is greater than the PD- 1 forecast. Both of these conditions result in a greater need for supply in real-time than was contemplated in PD-1. There were wind shortfalls in all but one of the 28 High HOEPs during the Current Reporting Period, and an under-forecasting of demand in 22 of the 28 High HOEPs. Figure 2-3 maps the HOEP against wind and demand forecasts, and shows a data point for each hour during the Current Reporting Period. The coordinates represent the degree of demand forecast error (on the y-axis) and wind forecast error (on the x-axis). If a data point lies above the x-axis, then real-time demand was higher than forecast (the forecast underestimated real-time demand). If a data point lies to the right of the y-axis, then real-time wind production was less than was expected in the PD-1 timeframe (real-time wind production fell short of expectations). California cap-and-trade auction predictably fails. An article in the Los Angeles Times notes the poor results of California's latest auction of greenhouse gas credits. Buyers at the auction took just 785,000 of the 43 million allowances offered, each of which allow the emission of one metric ton of carbon dioxide. All the permits were bought at the floor price of $12.73. But there is a secondary market, where the private parties who own the credits trade them daily. Those credits were recently priced at $12.34, well below the state floor in the auctions. It means that any company needing a credit could buy it more cheaply on the secondary market than in the auction. Another serious possibility is there is a flood of credits on a secondary market - credits attained without any real reduction in emissions, which I've learned from following Aldyen Donnelly are known as "hot air" credits. These are the credits that depress the carbon price. My province of Ontario may have chosen to join California in cap-and-trade precisely because it will be cheaper to purchase "hot air" credits from California than to attain actual carbon reductions at home. 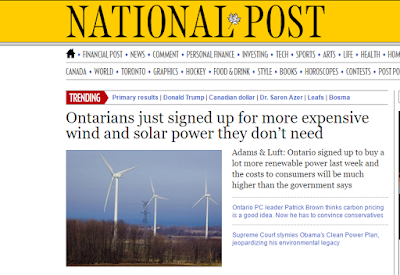 Things from around the web that caught my attention this week included the article I co-wrote with Tom Adams being the first story at the top of the National Post home page for a couple of hours Thursday. There's a lot I could ramble on about connected to the article, but the one I'll pick to emphasize is communication. It was terrific to collaborate with Tom Adams. Our histories are different, with me being perceived as pro-nuclear, and Tom not so much. My favourite comment received regarding this week's column was "Never thought I would "like" an article (co-)authored by Adams." The fifth anniversary of the the Tōhoku earthquake and tsunami passed this week. ...While I am immensely pleased that nobody has died or even gone to the hospital because of the effects of ionizing radiation released because of the meltdowns (radiation has of course been released, but in amounts simply too small to cause harm to anybody or anything), I have found these past 1,827 days to be rather frustrating. I harbour this naive fantasy that those who were surprised to hear me tell anybody who would listen to expect few if any casualties might revisit their initial surprise. I understand why they were surprised. I was one of very, very few people saying what I was saying. The vast majority of other commentators on the nuclear situation in Japan following the earthquake were saying just the opposite. They were telling everybody who would listen that there would be untold death and disease because of the release of radiation. I also understand why these prophets, false prophets I should say, got on the air: from the point of view of a media vehicle locked in mortal hyper-competition with other media vehicles for readers/viewers/listeners, it is much much sexier to prophesy doom and destruction. Reassurance is boring, even if it is bang on. I get that. What I find disappointing is that the prophets of doom, having been proved laughably wrong, are not being called to account. I mean, they said this stuff in public. You might think that having said things that prove they do not know what they are talking about, somebody might, you know, call them on it. Apparently such correcting of the public record is not a priority in the current media universe. It should be. There are real consequences to allowing alleged experts to utter falsehoods in the public sphere. Please read the full post at Canadian Energy Issues. While the Toronto Star was beating up on the National Post, and vice versa, the Globe and Mail's Marcus Gee wrote Like it or not, Toronto is a nuclear city. Gee's column is that rare write in Toronto that gets facts right. Wind, solar and bioenergy still account for just 9 per cent of Ontario’s electricity output despite the provincial government’s bungled, vastly expensive effort to promote them. I hope all read Like it or not, Toronto is a nuclear city, but the rest of this column is going to be about media in Toronto's steady production of poorly researched material - just using the 9 % figure. I happened to enjoy this interview, but I've been critical of Steve Paikin in the recent past and the graphic shows why. 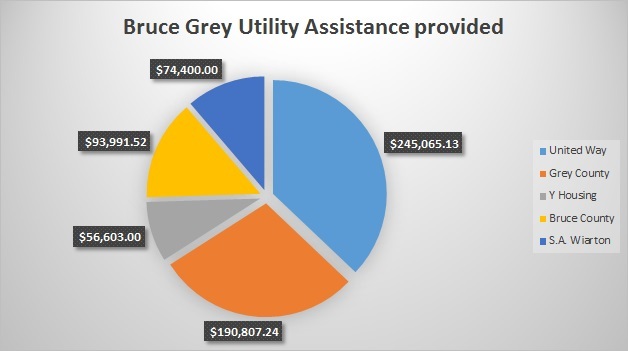 The graphic says, "Source: Ontario Energy Report, July-September 2015" - but that wouldn't be notable on the television during the program. The ontarioenergyreport.ca website does currently show prominently, on its home page, these percentages for 2015's third quarter "Transmission Grid-Connected Generation Output" - which is only a subset of "Ontario's Electricity Supply", and only for the quarter of the year when industrial wind turbines are least productive. If The Agenda's researchers went a step further, to the full supply report linked to following the percentages., they's have found the source table for the full year's data (2015), where wind was 5.8% of the annual "Transmission Grid-Connected Generation Output" subset, and solar and biofuel another 0.5%. That one step further is how far the Toronto Star's assembled team went in January while assembling Q & A for Ontario’s hydro system. ...British Columbia, which is home to 4.7 million people, has placed the highest price on emissions in North America, taxing a ton of carbon emitted at 30 Canadian dollars, or about $21. By comparison, emission permits in California and Quebec are trading at about $13 a ton. And permits sold for $7.50 a ton in a December auction in the Northeastern trading system known as the Regional Greenhouse Gas Initiative. That system covers emissions from power plants in nine states that include Connecticut, New York and Massachusetts. These actions deserve applause. But their real value may lie in providing a template for the rest of the world.